This white paper examines the Crimeware industry and the Web-based methods currently used to sustain cybercrime. 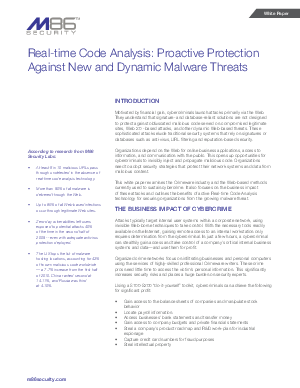 It also focuses on the business impact of these attacks and outlines the benefits of active Real-time Code Analysis technology for securing organizations from the growing malware threat. Motivated by financial gain, cybercriminals launch attacks primarily via the Web. They understand that signature- and database-reliant solutions are not designed to protect against obfuscated malicious code served on compromised legitimate sites, Web 2.0 -based attacks, and other dynamic Web-based threats. These sophisticated attacks elude traditional security systems that rely on signatures or databases such as anti-virus, URL filtering and reputation-based security.